Tornadoes are one of the most violent and powerful types of weather. They consist of a very fast rotating column of air that usually forms a funnel shape. They can be very dangerous as their high speed winds can break apart buildings, knock down trees, and even toss cars into the air. When we talk about tornadoes, we are usually talking about large tornadoes that occur during thunderstorms. These types of tornadoes form from very tall thunderstorm clouds called cumulonimbus clouds. However, it takes more than just a thunderstorm to cause a tornado. Other conditions must occur for a tornado to form. Shape - Tornadoes typically look like a narrow funnel reaching from the clouds down to the ground. Sometimes giant tornadoes can look more like a wedge. Size - Tornadoes can vary widely in size. A typical tornado in the United States is around 500 feet across, but some may be as narrow as just a few feet across or nearly two miles wide. Wind Speed - The wind speed of a tornado can vary from 65 to 250 miles per hour. Color - Tornadoes may appear different colors depending on the local environment. Some may be nearly invisible, while others may appear white, gray, black, blue, red, or even green. Rotation - When viewed from above, most tornadoes rotate counterclockwise in the northern hemisphere and clockwise in the southern hemisphere. Supercell - A supercell is large long-lived thunderstorm. It can produce some of the largest and most violent tornadoes. Waterspout - A waterspout forms over water. They usually dissipate when they hit land. Landspout - A landspout is similar to a waterspout, but on land. It is weak and is not associated with a vortex of air from a thunderstorm. Gustnado - A small tornado formed at a weather front by gusts of wind. Multiple vortex - A tornado with more than one spinning tube of air. Tornadoes are categorized by their wind speed and the amount of damage they cause using a scale called the "Enhanced Fujita" scale. It is usually abbreviated as the "EF" scale. 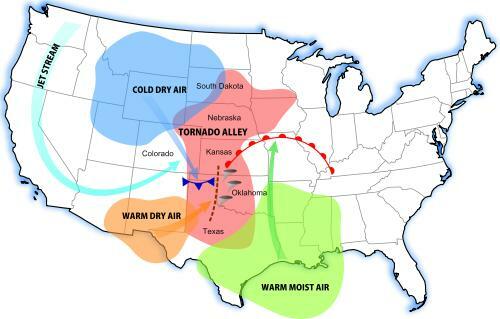 Tornadoes can form most anywhere, but most of the tornadoes in the United States occur in an area called Tornado Alley. Tornado Alley stretches from northern Texas to South Dakota and from Missouri to the Rocky Mountains. Other names for tornado include twister, cyclone, and funnel. In order for a vortex of wind to be officially called a tornado it must touch the ground. More tornadoes touch down in the United States than any other country, over 1,000 per year. The fastest winds on Earth occur inside tornadoes. Don't plan on outrunning a tornado, the average tornado travels at a speed of 30 miles per hour, but some can move at speeds up to 70 miles per hour. Tornadoes can be very dangerous. In order to save lives, the National Oceanic and Atmospheric Administration (NOAA) issues tornado "watches" and "warnings." A tornado "watch" means that weather conditions are favorable for a tornado to be produced. A tornado "warning" means that a tornado is happing right now or is going to happen soon. During a tornado "watch" you should begin preparing for a tornado. When you hear a tornado "warning", it is time to take action. Follow this link to find out how best to prepare for a tornado. Follow this link to find out what to do during a tornado.